As I pointed out on my Location tag earlier on Facebook, this is not my usual genre. Dramatic movies and I have an interesting interaction with each other. Mysteries work (Gone Girl). Human Interest Stories, generally don’t. Just general dramatic pictures about people don’t resonate with me as much. Most drama’s deal with the ups and downs of people like or very much not like us often in very realistic ways. They speak to the pain of the human condition and share the stories to those who might need to learn from it, learn about it, or get a glimpse into it. I don’t need other (inspired by, real, or imagined) people’s pain and heartbreak when my life has enough of that on it’s own. It’s part of why you won’t get a lot of those on my review site they don’t interest me intellectually or emotionally. They provide me nothing I crave or even need. Dunkirk as an example, was going to be a cinematic experience retelling a harrowing event in World War II history. It was going to be told by a technical master Christopher Nolan. It was going to be so technically proficient people were going to bend over backwards to talk about how amazing it was. I knew all of this the moment I saw the trailer. But because of all of this, that left me wondering what I’d get out of the movie. Another example is Titanic. Historical event, one I studied extensively prior to her rediscovery, but there I had a love story and an emotional beating heart that carried me through. Granted the tragedy itself to see something I knew so well recreated (based on current understanding) for the cinema was gut wrenching and delivered for me both an emotional core and intellectual appreciation. This of course leads up to me seeing A Star is Born. A movie well out of my normal tastes, but starring the one and only Lady Gaga. Many people will be talking about this in relation to the Barbara Streisand version from 1976. I don’t particularly care for her (she’s fine, just not my taste in music or acting), and thus have not seen that version. What many will not likely be discussing is that this is the fourth remake of the story. There is an original Academy Award winner, plus six additional nominations, from 1937 produced by Gone with the Wind’s David O. Selznick. In 1954 it was remade somewhere over the rainbow with Judy Garland and James Mason, this one was only nominated six times for the Academy and didn’t win there, but Judy and James both took home a Golden Globe for it. Then there is the infamous 76 version ( a good year if I must say), which according to Rotten Tomatoes only has a 32% score. There are stories abound on ego and personality clashes behind the scene with Streisand for better or worse coming out victorious on those. Now we have in 2018 a new adaptation with screenplay credits going to Will Fetters (mostly romantic dramadys), Eric Roth (Munich, The Good Shepherd, Ali), and Bradley Cooper debuting in his first screenwriting and directorial credit. Cooper of course has a million dollar smile and rose to wide audience fame with the Hangover series, and Silver Linings Playbook opposite Jennifer Lawrence, More recently he has been working in providing the voice to Rocket Raccoon in the Marvel franchises. The three of them had a lot to work with as the movie has so many adaptations, but as near as I can tell they made it their own while still keeping the rise and fall of two performers who love each other at the core of the film. Make no mistake this movie does have a core and that is it. While it doesn’t delve deeply into the rise from a story perspective, it does show the fall and the prices paid continuously through out. A cynical critic may pick on the fact that Coopers own character is the focus of that fall and dominates the majority of the screen time. I suppose though, its particularly noticeable as whenever Lady Gaga is on screen as her character Ally, she rules. She has such tremendous screen presence and gravitas in her performance through the movie it would surprise you that beyond American Horror Story this is her first full on role in a major production. She nails ever scene and the camera just falls in love with her; credit to the director – Cooper – and cinematographer – Matthew Libatique (Black Swan, Mother! )- there too. We all knew by now that she was a stage performer from her years of giving us all that she has as Lady Gaga, her songwriting, production, and performances have helped redefine what the music industry could be. Here she lets the full weight of her acting chops go and it is a wonder to behold. Cooper of course is fine, as he has a different burden to carry here he does deliver it well. More on that after the TL;DR. Sam Elliot makes a surprise appearance but reminds us why we love him. The rest of the supporting cast gets very little time, and most everything is focused on Gaga and Cooper as it should be. A Star is Born provided both emotional depth and intellectual depth for my entertainment needs this evening. My movie going partner tonight and I were able to talk about some of the aspects of the movie after and well there is a lot to talk about. This will without a doubt get at least a few nods at both the Academy and Golden Globes. I would truly be surprised if it didn’t. The screen work and camera work is amazing. The songs are beautiful and heartfelt and the performances to go with them and the chemistry all work to make a Star is Born a bona fide great movie. No, but you’ll need to read on to find out why. Will you buy it then? Wait you didn’t answer if I should see it. Ok, should I see it then? The rest of the review should give you an inference, but *sigh* Ok. I need to discuss something here. 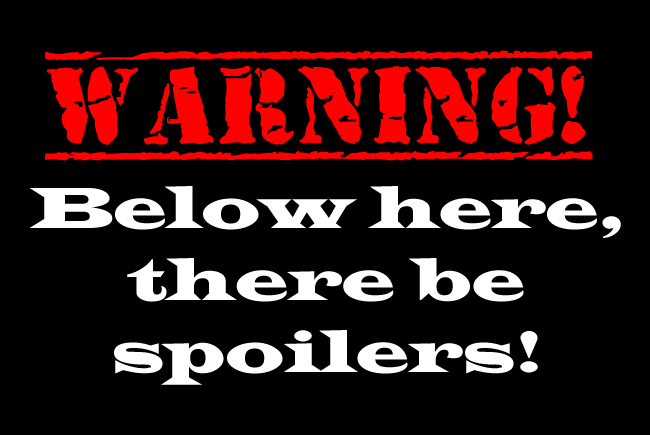 It violates my no spoiler rule, so here’s your warning banners. Stop now if you don’t want any spoilers. Ok. No roll over text here. This movie needs a trigger warning. There is an emotionally powerful and charged scene involving suicide during the movie. I didn’t know it was coming but I broke down crying watching it. I left the theatre immediately as the credits rolled to collect myself. I suppose the scenes were there telegraphing it, but it was still filmed in such a way that it was a gut punch I hadn’t braced for. It’s not glorified and it is horrifying. It is not gratuitous, but in those facets make it all the more poignant and painful to watch. So please if you are triggered by Suicide in/on film do not watch this movie or be prepared to leave when you see the signs coming – and you will see them. Sorry I don’t like dropping spoilers, but this may have decided if I saw this tonight or not. While I am glad I did see it, I am glad for the conversation I had after for almost an hour, if my head space had been worse or company I was in not nearly as awesome – it could have been a bad space night with a lot more tears and triggering responses. Don’t worry, I am fine. I just feel I have a responsibility to my readers to let them know.